Consumers have a lot of choices these days when it comes to heating and cooling systems. One option is right below their feet—taking advantage of the earth’s constant underground temperature nearly 30 feet below the surface. Geothermal heating and cooling uses the Earth’s natural capacity to store heat to keep your home or office at a constant temperature while simultaneously lowering your monthly utility bill. Geothermal heat pumps are technologies that leverage the nearly constant temperature below the earth (regardless of the season) to heat and cool buildings. 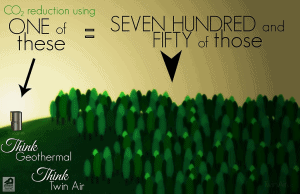 Just a few feet under the ground, the earth has a constant temperature of between 50 to 60 degrees Fahrenheit. The temperature below the earth is warmer than the air circulating above it during winter and cooler during summer. Geothermal heat pumps are far more advantageous than traditional heating and cooling systems because they tap natural, free heat under the ground. They also operate at peak efficiency when cooling your home. Efficient operation is good for the homeowner as it saves energy, money, and minimizes environmental degradation through pollution. Because geothermal heating and cooling works more efficiently than traditional HVAC systems and takes advantage of heat that already exists (vs creating new heat), it can save the average homeowner between 40%-60% on their monthly energy bill! This can mean saving hundreds of dollars every month and, over time, will more than compensate for installation costs. One family who made the switch to geothermal and now they heat and cool their 3,500 square foot home for an average of $118 a month! An additional benefit to geothermal heating and cooling is receiving a consistent bill. Shifting energy costs throughout the seasons can make maintaining a budget difficult, particularly if you are on a fixed income. The efficiency of the geothermal system significantly levels out fluctuating energy costs, making it easier to predict your monthly expenses. As folks get closer to retirement age, this aspect of geothermal energy becomes particularly attractive. Geothermal pumps as significantly quieter than their traditional counterparts because there is no outdoor unit. Instead of the disruptive blowing of massive fans, homeowners can expect the noise level to be closer to the quiet hum of a refrigerator. Geothermal energy is also good for the environment because, unlike most energy sources, there is no combustion involved, meaning that there are significantly fewer greenhouse gases released. Because they run on a naturally renewing energy, geothermal pumps don’t run the risk of shutting off in the winter like typical furnaces do when they run out of oil or gas. The government has also instituted a 30% tax credit for the installation of a geothermal system, meaning even more long-term savings. 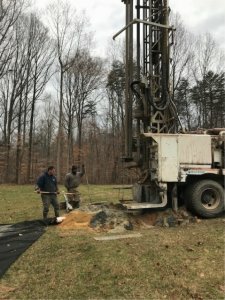 If you’re interested in having geothermal heating and cooling installed or simply have more questions about the process and savings involved, visit TwinAir’s website or give us a call at 703-754-1062. 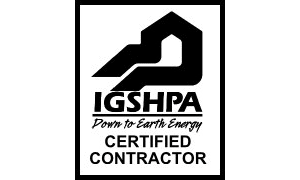 TwinAir is an IGSHPA Certified geothermal installer with an excellent reputation and track record, committed to getting things right the first time. We would love to talk to you more about how geothermal energy can help reduce your bills and stabilize your budget.